With the introduction of iOS 11 and macOS High Sierra, Apple has added some new features to iCloud Drive, offering the ability to share files. iCloud Drive is now offering sharing services similar to what DropBox and Google Drive offer. In the past iCloud drive was designed for personal access to files. 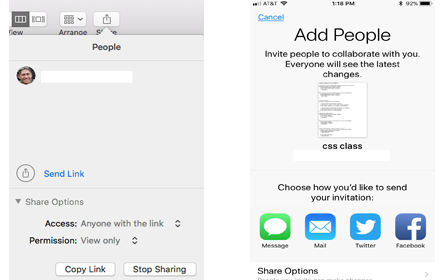 For a user group, they can now create or use an existing iCloud account and share files with members or allow board members access to files. Apple’s iCloud file services originally began as cloud storage for your iWork files. With the introduction of OS X Yosemite, it expanded to offer you storage of files and folders beyond iWork. In fact you can now access your Desktop and Documents folders in the cloud and on other devices. But in this article we are going to focus on the sharing features. As each macOS update has come along, Apple has continued to expanded its iCloud offerings. To gain access to these new share features of iCloud Drive, you will need to be running macOS High Sierra on a Mac and/or iOS 11 on and iPad or iPhone. The individuals you are sharing files with simply need internet access and the file sharing is not platform specific. iCloud drive is currently specific to sharing files. You currently cannot share folders in iCloud Drive. From your desktop of your Mac computer, you can navigate to the Go Menu and open iCloud Drive. To enable the sharing features of iCloud Drive, you simply need to select a file in your iCloud Drive. Once the file is selected, you will access sharing menu and select the Add People from the menu. User groups may not have a specific computer, so you can access your iCloud drive via a web browser at iCloud.com and share files from there. Once you click Add People a window will come up giving you the option on how to invite others to access the file. You can share the file link via email, Messages, copying the link, Twitter, Facebook or AirDrop. You will also be given the opportunity to set permissions on the file. Permissions include who can access the file, and if they can make changes to it or view only. Once you have selected the settings, click Share. You will then be prompted to enter the recipient of the shared files contact information so they can receive the link to the shared file. 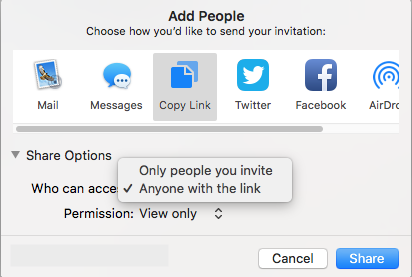 For user group purposes, the Copy Link would be the best option (if accessing via iCloud.com you can share via email or by copying a link only). With the copied link, you could email, post on group website, or put into a newsletter a link to the file. While on the subject of newsletters, you could use the iCloud Drive sharing features to distribute a digital copy of it that way as well. Just as you have the ability to share files, you have the ability to stop sharing them as well. Simply return to the Share Menu and under the Show People section you can click shared options and stop sharing. As mentioned earlier, the sharing features were incorporated into iOS 11 as well. There is a now a default app called Files (formerly iCloud Drive app in iOS). 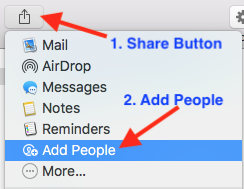 You can navigate to your iCloud Drive files there and select a file and click the share icon to Add People following the same process in High Sierra.